He’s one of the unsung heroes of late ’80s grahic design. Unsung Euro should I say, as Francesco Albertini came all the way from Italy and landed a job on H-Street, designing among other things the famous “four-arrowed” logo which was to become a fixture so iconic that my friends and I would reproduce it as a stencil and sell it -true story, we made about 6 bucks in two years. Were you a graphic designer/artist before you moved to the US? The immense love for skateboarding. I “had to” be part of the scene. Here in Italy skating did not exsist at all, we were very few people (still all friends!) and I was “crap” to all my school mates, girls, and so, as I was completely perceived as nut, hanging around with a skateboard at 17. How did you meet the H-Street dudes? I had already been in California for 4-5 weeks and had already spent a few (3-4) weeks at Vision because, about 2-3 months before I took my first plane to the US, I did ship a package of designs, shapes and ideas to Paul Schmitt at Vision. I chose them out of my passion for their brands Sims, Vision and Schmitt Stix. I already tried before to do a graphic for Kevin Staab, though. I met him in 1985 at Bourges’s Summer Camp in France, together with Mike McGill. He was then on Powell and not only really, really rad, but also a super cool person, same as he is still today, and so he gave me his home address in Arizona. I tried to design a Cactus-based graphic for him for Powell, but of course the result was – I guess – really goofy… Anyway he then switched to Sims and had one of the “killerest” graphic ever done by Lucero. I was stocked that he was in my “dream” team, Sims. When I showed up, I really couldn’t believe my eyes that a skateboard company could be such a huge, well-established and professionally driven company. I was welcomed by Paul Schmitt, and he told me that my ideas got really appreciated by everybody. One lucky shot I had, is that those were exactly the months in which everybody was designing new, advanced shapes, after Christian Hosoi and Lester opened up new frontiers. By chance, it happened that one of the shapes I draw, was virtually identical to the newest shape Jeff Phillips draw for his second Sims pro-model. Brad and Paul were stocked that somebody from nowhere (Italy) could draw something so technical and up-to-date like one of their top pros. So I stayed at Paul’s home for all that time. Learned everything about silk-screening, skateboarding manufacturing, color-separations, etc. I drew some clothing details, that ATV board, a T-Shirt for their SS Rip Saw model… some other stuff. I even attended a Trade Show event while I was with them. Paul has been so unbelievable nice and cool with me. I then decided to move, considering I might have come back after a while, just to have more free time to visit California a little bit, try to reach some skateparks and see the scene (at Vision, was just work, obviously…), go to Del Mar and Upland… all my teenage European dreams, I mean. I then met Tony Mag at Lance’s Ramp. I saw him driving down the way on a car, as I was walking up the hill. Then I guess they stopped at cross road, and I skated back down to meet him. I knew he was from Europe, so I though he might have help me some way. 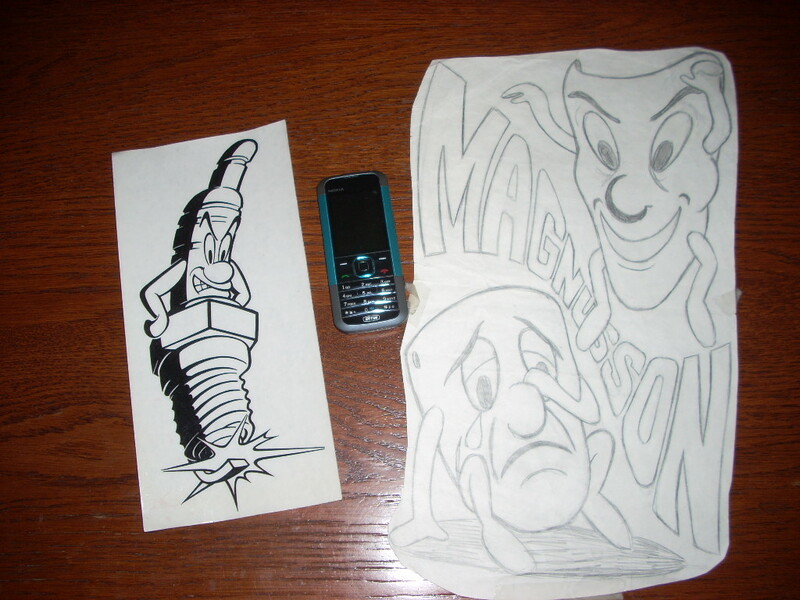 Plus I saw he had a new pro-model called “Magnusson Design”, so I thought that perhaps he might have need some more graphics. Kinda like draw-4-food, if you like. Is that right that you designed the H Street arrows logo? What did it mean? Yeah, it’s right. Actually I also draw the very first logo, the one with paint-brush like letterings over clean ones. I did that right after Tony told me he was thinking about a more structured company, and H-Street was a name they were thinking about. That was right the first time ever we met, on the street up to Lance. I draw that and then I took a bus to San Diego, where Tony lived. I just couldn’t just show up with empty hands! That was about 6-8 months before H-Street was founded. Then, a couple of years later, 1989, I went back to the States, and I was thinking about having a more “solid” and iconic logo. So I came up with the arrow logo. The shape came out as I was thinking about something somehow “street related”, like a sign or else. I figured that H-Street also might stand for “each street”, like if you are in a cross road and could go in any direction. What most memorable boards did you draw on H Street? I don’t know. Perhaps my first T Mag, the Mini MRI, because it really was a complex one, all hand-done on each of the 6 color separations. Then I like the El Gato with the fish bowl, the Sonner, the Hensley King Size, that was also recently “stolen” by Black Label, without even asking Tony or sending me a complimentary sample of it. Why did you think that eagle was a good fit Matt? I was in Rome. I was just going back and fort cause my visa every time only lasted 6 months. And I was thinking about making a special graphic for Matt. One of the cool thing about H-Street, is that nothing was really driven by the business, but our intuitions and motivations was the engine of it. So I was just thinking that his “true” new graphic had to be that one. To me he was very cool, but also a truly “soul” type of person. He was like a modern cowboy out there in the middle of nowhere pioneering on his skateboard. So his graphic had to be simple, clean and rad. Just like the desert is. 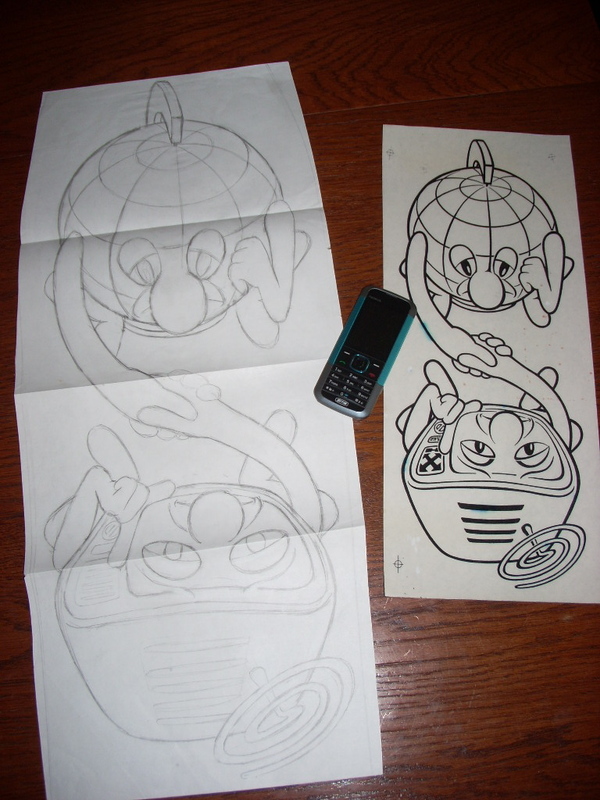 I also decided that I really wanted a one-color graphic… something like you could do yourself with a drawing pen. That’s way it’s all so basic and raw. What are some of the best anecdotes from your time there? Wow, just can’t name them. That was my whole life, not just designing artwork; plus, I was from Italy, didn’t have a stable place, didn’t have at first a driving-license… so there’s just so many! Perhaps Tony might rememeber when I used to “sneak” food out of everyones’ kitchens, cause I was just frightened by the chance that tomorrow I might not have a meal. Or when we drove down to Tjuana and, well… I didn’t bring my passport with me, so at the boarder on the way back I had to look like I was a drunk American citizen, with everybody playing that game to support it. 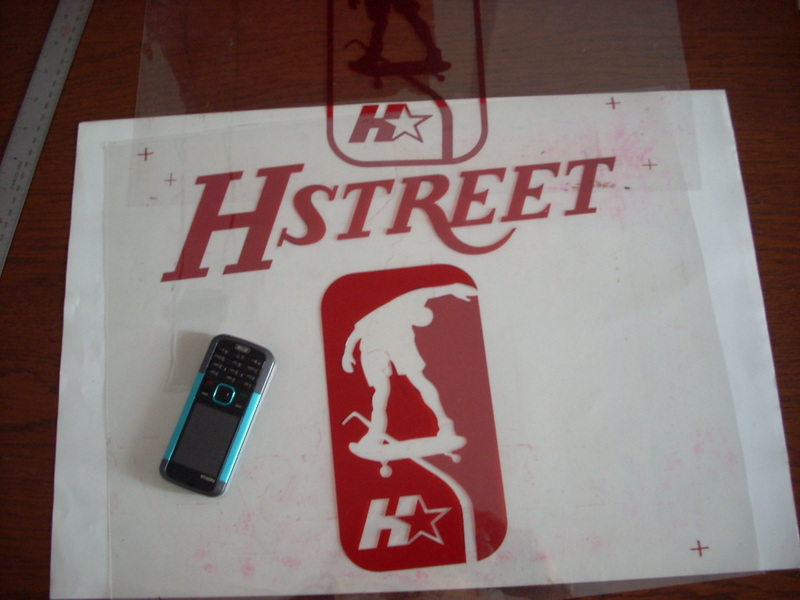 Was H Street the only skate company you did stuff for? No, I did graphics for Schmitt Stix at Vision first (my poker-card ATV is still one I really like, plus Paul really is and was a very cool person), Then I draw graphics for some minor brands, like Uncle Wiggley’s, that was Tony’s woodshop, and I recently did one of the lasts Giorgio Zattoni model, here in Italy. Are there any graphics you did for them that never came out? I went back to Italy. I dreamed at first about making up a sort of H-Street Europe, but that was right in the middle of the market crash in 1991-92… so, no way it could work. Plus, I really started to deeply hate how and what skateboarding was becoming in those days: only street skating, everybody was pro, everybody had a pro-model, vert was dying, wheels were getting smaller and smaller every day, just like a skateboard was not a SKATEBOARD any longer, but just a stick of wood you could static-ollie on. I hated it up to a point were it seemed very dull to me. Now though, skateboarding is stronger than ever! Is at the same time 100% pure-classic-everlasting skateboarding with all the new technical tricks and stuff into it. Simply back to the best thing ever. I then started to work in real big advertising agencies as account and planner. BBDO, Ogilvy, Saatchi&Saatchi. What do you do these days, job-wise? I do consultancies on marketing and advertising-communication projects. You are still skating, right? … And where does that passion for Sims boards come from, by the way? I don’t know. We didn’t have any skateshop here in Rome back in those days. It was very rare to see a new skateboard from the States. But in the magazines, the Sims models just looked the coolest, plus I loved Brad Bowman and Dave Andrecht. The Christian model came out, the Jap flag, and it was touch-down. One of the raddest deck ever. I also have to say that kick-tail degree of Sims and quality of wood and constructions was the best! Elle est où sa belle rampe romaine ? Dans quel coin ? Quels sont les “lieux de vie” du skate à Rome ? 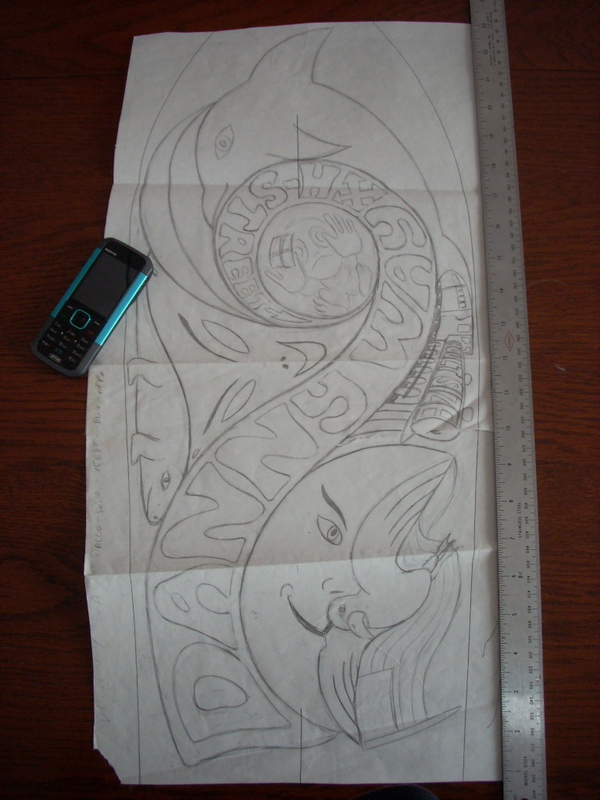 Never knew it was this chap who did the H-Street graphics back then. 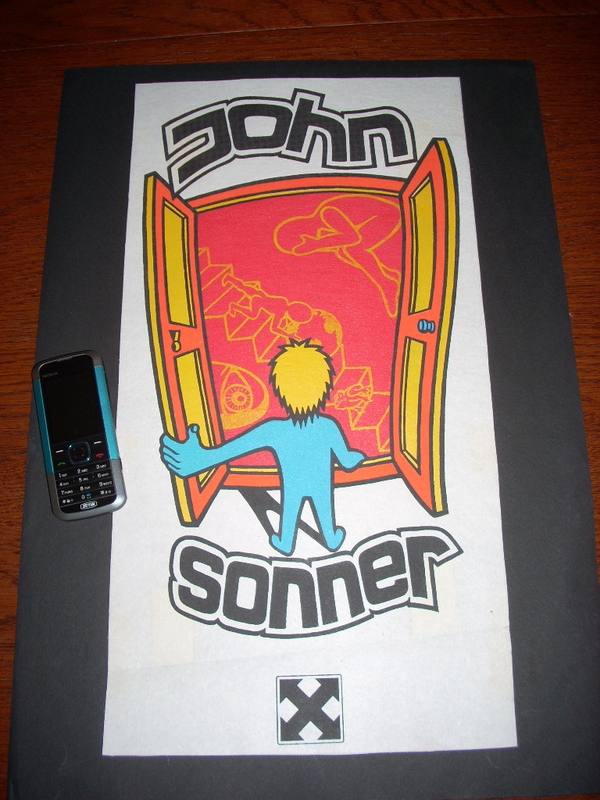 The John Sonner was a classic I checked out in the local shop so much. Beyond stoked on the Hensley King Size though, that was my second pro board when i was 14, classic! Good itw Seb! He just deserves this… btw I skated with him last month at the Cinecittà bowl for The Marcin Solecki memorial day. Still rippin. Ah, it’s nice to discover who did the magnificent H-Street art. I loved the arrows logo. I always drew it on the covers of my school notebooks. et hop, je viens de tomber sur un jeu de roues H Street: 60 mm 95 A.
à venir sur Sakaroulé !